If brain cancer is diagnosed, there are a number of treatment options available to you. While past treatments would often rely on surgery, today’s modern treatments are far less invasive, more comfortable, and more effective. At Orange County CyberKnife, we’re proud to offer one of the most effective radiation therapy treatments on the market. We’ll work with you to determine a brain cancer treatment course based on the type of tumor, location of the tumor, size of the tumor, and your age and general medical condition. CyberKnife is a revolutionary radiosurgery system designed to deliver high-dose radiation directly to the site of a tumor, while minimizing damage to the surrounding tissue. The CyberKnife system combines a variety of highly advanced medical technologies to create a noninvasive, safe, and comfortable brain cancer treatment in Orange County. CyberKnife works by delivering a beam of high-intensity radiation directly to the site of the tumor. This radiation interferes with the tumor cells’ ability to multiply, and once the existing cells die, the tumor is naturally eliminated by the body. The radiation is precisely measured and calibrated by your radiation oncologist, medical physicist, and dosimetrist to minimize damage to other areas. CyberKnife can track minute-by-minute changes in the tumor’s location due to normal movement and breathing. It will adjust the radiation beam to account for this movement. Usually, cyberKnife brain cancer treatments in Orange County are completed in as little as 1 to 5 days, have few side effects, and have been clinically shown to be a highly effective cancer treatment system. Glioblastoma multiforme, also referred to as GBM, is a type of primary brain cancer, meaning GBM tumors begin in the brain instead of starting somewhere else in the body. GBM is the most common type of brain cancer in adults. At Orange County Cyberknife, there is always hope to beat a cancer diagnosis like glioblastoma cancer, especially with new state-of-the-art technology like Optune glioblastoma treatment. Optune is a wearable, portable head device that when turned on creates low-intensity electric waves called Tumor Treating Fields or TTFields. These electric waves are transmitted to the GBM tumor to interfere with tumor cell division, which in turn will slow or stop glioblastoma cancer cells from growing and dividing. And, in some cases, it will kill the tumor cells as well. Optune is area specific, meaning it will send the electric waves directly to the GBM tumor in a highly effective manner to stop the spread of cancer. 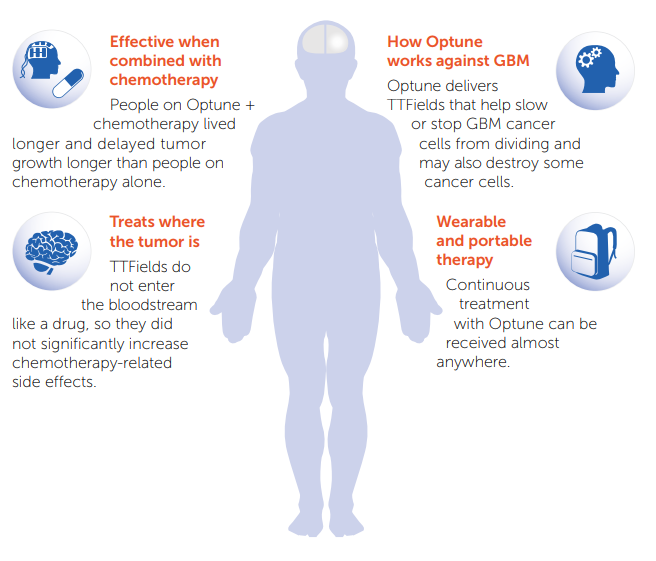 Optune can be paired with radiation, chemotherapy, or used on its own, depending on your specific glioblastoma treatment and diagnosis. Your experienced Orange County Cyberknife oncologist and radiologist will discuss which option will benefit you the most. With Optune, our team can return you to a normal, healthy life! 3D Conformal Radiotherapy (3D-CRT): This method uses imaging technology like CT and MRI scans to plan your radiation dose in detail, selecting the ideal angle for radiation. Combining these technologies allows for a maximum dose of radiation to be delivered to the tumor while minimizing the dose delivered to healthy, surrounding tissues. Intensity Modulated Radiation Therapy (IMRT): This type of treatment uses 3D imaging technology to “paint” radiation doses onto the tumor. The doses are applied from various angles, and the intensity of the radiation is modulated from angle to angle. This allows different doses of radiation to be applied to different areas of the tumor, creating a highly effective treatment while minimizing exposure to surrounding tissues. Optune Glioblastoma Treatment: This type of treatment uses a wearable, portable head device that when turned on creates low-intensity electric waves called Tumor Treating Fields. These electric waves are transmitted to the glioblastoma tumor (primary brain cancer) to interfere with cell division, which in turn will slow or stop cancer cells from growing and dividing. And, in some cases, it will kill the tumor cells as well. Optune is area specific, meaning it will send the electric waves directly to the glioblastoma brain tumor in a highly effective manner. Optune can be paired with radiation, chemotherapy, or used on its own, depending on your specific glioblastoma treatment and diagnosis. No matter what your condition or what treatment method you’re interested in, the cancer treatment specialists at Orange County CyberKnife are here to help. We know that a cancer diagnosis can feel like a crushing blow, but trust us: there is hope. If you or a loved one have recently been diagnosed with cancer, we would be happy to speak with you. Feel free to call us at 714.962.7100 with any questions or reach out to us at our contact page to schedule a consultation. We can’t wait to hear from you, and we look forward to helping you beat cancer and reclaim total health.